Voice your opinion! 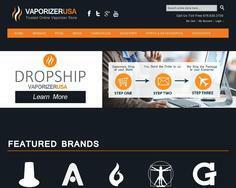 Review Vaporizerusa now. Ordered my E-pen just to get dissapointed that it was broken. The box that it came with seemed in a very bad shape. What is more, after more than a couple tries, the vaporiser seemed to produce smoke only on a few occasions. Possibly the heating element was broken or out of order. After a long battle of exchanging long emails with the company I got a replacement that was delivered with a delay. I am really unhappy with their goods as well as the customer service they provided. Avoid this company.